A New Jersey groom accused of forcing a waitress into a bathroom stall and exposing himself at his own wedding appeared in court on Thursday, and his new bride was with him. The Judge ordered everyone to leave the courtroom for that hearing in order to protect the alleged victim. Matthew Aimers faces indecent assault charges for allegedly pushing himself on an underage waitress at his own Bucks County wedding. The judge cleared the courtroom Thursday in order to protect the alleged victim. Aimers' attorney has denied all charges. 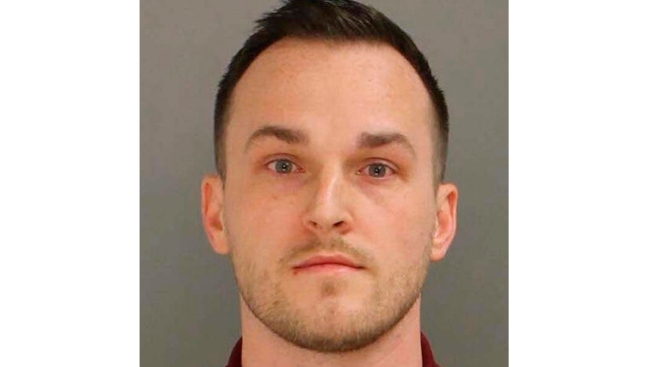 A groom, who police in suburban Philadelphia say forced himself on an underage waitress at his wedding reception and was then taken from the reception in handcuffs, is facing indecent assault charges. Matthew Aimers, with his wife on his arm, arrived at a Bucks County court Thursday where a judge upheld charges of false imprisonment, corruption of minors, indecent assault, indecent exposure and related counts against the 31-year-old. The charges stem from Aimers' alleged actions during his Thanksgiving weekend wedding at Northampton Valley Country Club in Richboro, Pennsylvania. Investigators say the waitress rejected Aimers' advances during the reception. The Willingboro, New Jersey, man then allegedly followed her into a restroom, exposed himself and tried to remove some of her clothing. He also allegedly told her he would give her $100, investigators said. The judge cleared the courtroom Thursday in order to protect the alleged victim. Aimers had also been charged with being involved in a fight at the wedding and refusing to be taken into custody. Those charges have been dropped, however. Back in February, his attorney, Louis Busico, said Aimers "completely maintains his innocence on all charges." Busico spoke to reporters again Thursday, claiming that the fact that his client's wife was still with him proved his innocence. "If that young man committed a crime at his reception, Dr. Phil couldn't fix his marriage," Busico said. "The fact that she's with him tells you he's an innocent man."